Sometimes 3G/4G networks will broadcast a better connection than those from the ADSL network. TP-Link presents the new Archer router MR400, which is upgrading from the predecessor Archer MR200 AC750 Router, when ADSL access is not possible at home or on the move, the TP-Link Archer MR400 Router can take over to distribute the connection of 3G/4G mobile networks via WiFi. With the MR400 Router, there is an Ethernet cable packed that can be used to wired one to four PCs via the dedicated ports. 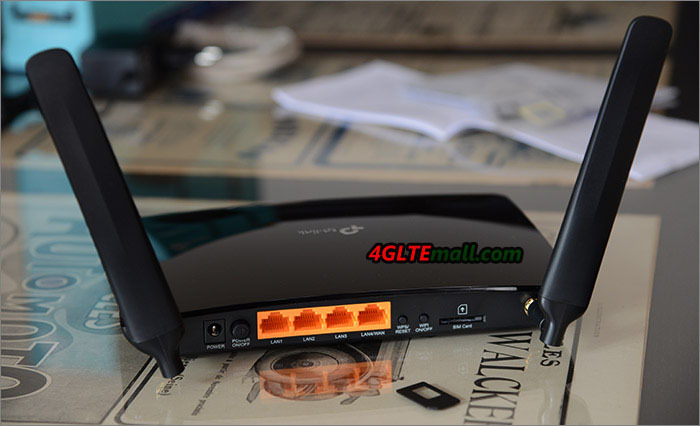 The 4G LTE router has a power button, reset or access to WPS for a fast connection and a button that allows to enable or disable the Wifi connection only. The location of the SIM card is easily accessible. 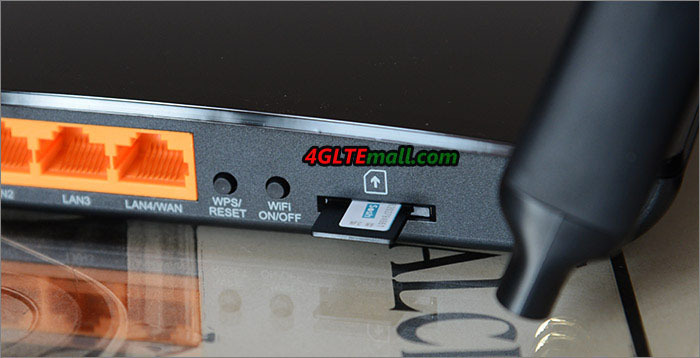 Two adapters for Micro-SIM or Nano-SIM are provided; one click shows that everything is well engaged. The MR400 Archer is light and rather pleasant at the design level. However, the black body seems to be a little textured and not glossy. It acts like a dust magnet and even with clean hands fingerprints appear from the first manipulation. Once the SIM inserted and the router MR400 connected to the wireless network, the LEDs give the status on the connection of the device and the availability of the wifi. They are however quite discreet. The manual prompts you to first connect to the wireless network whose name (SSID) and password are listed under the router. 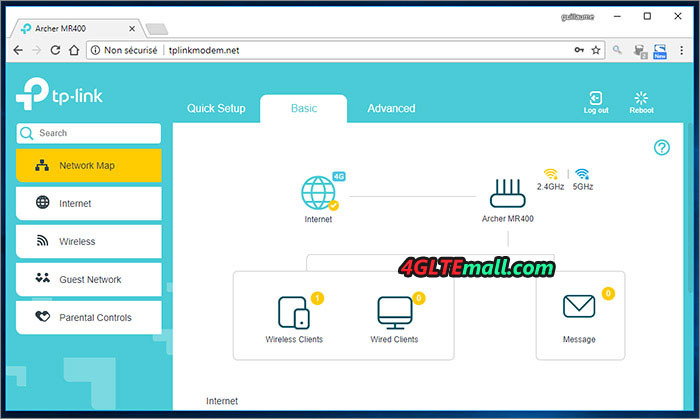 It is then necessary to access the interface of the router via an internet browser by entering the IP address 192.168.0.1 or tplinkmodem.net. Here it is possible to enter the default identifiers (admin / admin) to enter the interface. The password can be changed to the one per user’s preference. To configure from a smartphone or tablet is more easily, TP-Link also offers applications for iOS (download from Apple store)or Android(Download from Google Play). A small assistant helps the user to configure the router in 3 simple steps, it was enough to leave the information by default. Before that you have to enter the PIN code of the SIM card. The interface indicates the path to follow to access it. Once the connection is tested and the wizard finished, we connect to the interface. It is well designed and easy to handle if you speak English. 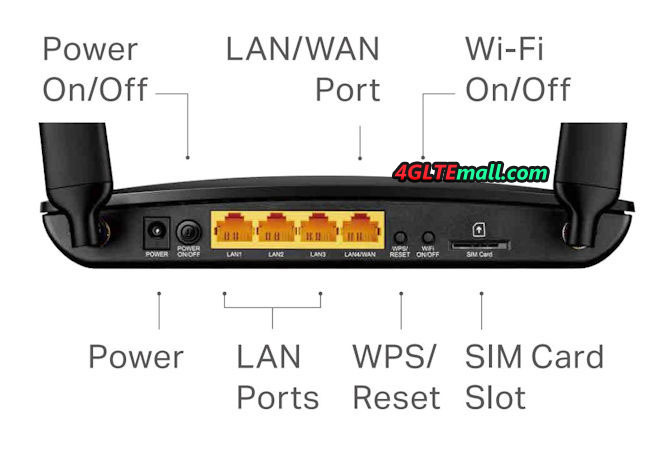 The “Basic” tab contains a graphic representation of the network and the devices connected to the routers, the possibility of modifying the Wifi parameters, activating a guest network or a parental control function. The “Advanced” tab contains everything that can be expected from a conventional router: NAT rules, security settings, bandwidth control to avoid eating too quickly his package or even what to connect to a VPN. 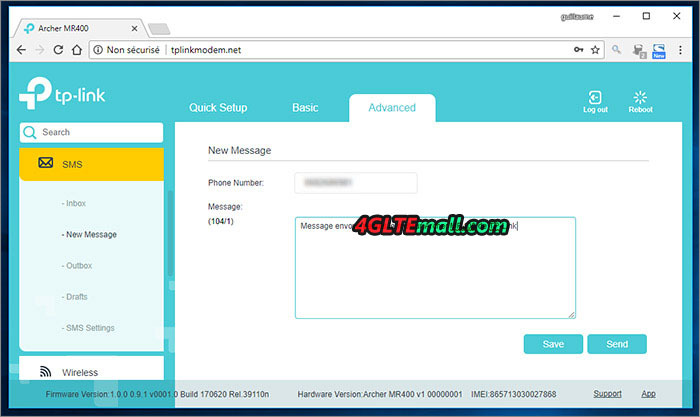 An SMS section allows to send text messages without leaving the interface, it worked without difficulty. The bandwidth test was very convincing with an excellent bit rate that makes us forget that we are connecting to a mobile network and not to ADSL. Of course the quality of connection depends on the presence of 3G or 4G antennas from the operator, but the result is more fluid than using the modem of the smartphone. Dual-band – both frequencies can be simultaneously enabled, with WiFi speed up to 1350 Mbps. Fully compatible with 802.11b/g/n/ac standards. Two external antennas for reception and three internal WiFi networks. External antennas can be replaced with more powerful antennas with SMA connection. Ethernet WAN – One LAN port can be used as a WAN port, allowing the device to work as a wireless router. The Wi-Fi Protected Setup (WPS) feature enables wireless network encryption and devices to be connected at the touch of a button. The DoS / SPI firewall protects the network. The Quality of Service provides more bandwidth for speed-demanding activities such as games, VoIP calls, and videos. IPv6 Support: IPv6 is a new network capability that will in future replace the IPv4 protocol used by all devices. Networking IPv6 support therefore enables the device to work with future technology. A separate power switch as well as a button from which the wireless network can be closed and started. TP-Link regularly offers new firmware for the Archer MR400 Router on the support pages of its site. For now only English is available, on the other hand it is a pity to have chosen a body material that is certainly very flattering visually, but also very messy. However, the TP-Link Archer MR400 router is doing the job well, and the configuration is very easy. The interface is quite simple to handle, even for those who do not speak English fluently and the application also allows some settings from a smartphone. In all, TP-link Archer MR400 is a good router for home or office.